Seven ancient warriors have been fighting for control of Japan for almost two centuries. They have now been reincarnated as high school students. Shou Haou, the mightiest of these warriors, returns in the form of Hakufu Sonsaku, a blonde, overly-endowed airhead. Let the battle begin! An in-depth discussion of this series won't be necessary, and I'm not even going to attempt to explain the plot; not only would it be impossible, but the plot of this anime series is really just an excuse to stage numerous fights scenes. In my review of New Fist of the North Star, I stated I'm not into watching thick-necked boneheads beat the crap out of each other, and I'll stand by that. But teenage girls in short skirts beating the crap out of each other? That's a different story. 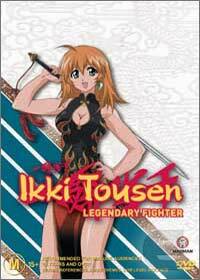 Ikki Tousen entertains in spite of itself. Yes, the plot is dumb. No, it doesn't make a whole lot of sense. It's ridiculous to think the fate of a country will be determined by a bunch of horny, teenage martial arts masters. (You'd think one of them would realize this whole thing could be solved if somebody would just pick up a gun.) Hakufu is pretty much an idiot (but I'm sure even she knows Chicken of the Sea is actually tuna), and most of the other characters are devoid of distinct personalities. The only exceptions are Hakuf's mother, who just might be a nymphomaniac, and Saji and Ryonou, two of Hakufu's rival classmates. Saji likes to guess bra sizes by feeling up anyone who'll let him, and Ryonou achieves sexual release while she's fighting. An attempt is made to delineate the various factions and allegiances, but the sheer number of characters involved makes it nearly impossible to keep up. This really doesn't matter though; about the time I gave up trying to sort everything out people started dying. The best thing about this series is its refusal to take itself seriously. C'mon, could you imagine this thing being played with a straight face? We're talking about serial cat fighting here. Remember the Uma Thurman/Daryl Hannah fight in Kill Bill: Volume 2? Imagine Quentin put them in schoolgirl uniforms and shot the scene from a low angle. Now imagine they both start losing their clothes halfway through the fight (and don't seem to notice). See the appeal of this series? Achieve the right tone and it's possible to make almost anything palatable. Geneon is responsible for this release, and it's representative of their exacting standards. The video is dead solid perfect. The bright color scheme is beautifully represented, with terrific saturation, and absolutely no edge enhancement, artifacts, or bleeding. The dubbed soundtrack and the original Japanese mix both have good channel separation, with a good bit of bass activity and, when required, a nice wide soundstage. A full surround mix would have been nice, as there are a couple of 747 flyovers that, while sounding impressive in stereo, would probably tear off the roof in 5.1. Still, what's here is a solid effort. Extras consist of clean opening animation, an art gallery, and some hidden outtakes (which I couldn't find to save my life). Ikki Tousen isn't art, and it won't change your life in any way, but it is a pretty good distraction. This one definitely qualifies as a guilty pleasure, a perfect example of the triumph of style over substance. Creator Yuji Shiozaki and Geneon Entertainment are found not guilty on all counts. Bring on the rest of the series!